This kit includes a fuser and genuine HP roller kit. For use in all HP LaserJet 8100 and 8150 series printers. Alternate part numbers C3914A, C3914-69002, C3914-67902. You can save some money by purchasing the fuser on exchange; see exchange terms in details below. 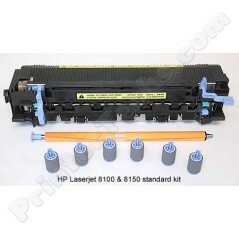 HP Laserjet 8100 and 8150 series maintenance kit. A note on PrinterTechs quality parts. There are a heck of a lot of 8100/8150 series maintenance kits being sold with really poor quality parts. How do we know this? We’ve tested the available rollers and fuser components for these printers for years. For example in the fuser, most companies use less expensive low quality bearings, gears, and upper fuser rollers. We use the original OEM upper fuser roller, which lasts a LOT longer than anything else on the market. Our bearings use a high temperature grease – which many companies fail to consider, and when available we use OEM gears. These quality parts ensure better longevity and cleaner prints than any other compatible fuser on the market.